Admiral Street is located in the Kinning Park area of Glasgow. The development site is set between Admiral Street and Stanley Street surrounded by a mix of residential and commercial premises with the site itself formerly being home to a confectionery factory in the mid-1900s. After being demolished and becoming a gap site, CCG (Scotland) Ltd purchased the land in 2015 with the intention of using the land for residential development. Upon a detailed assessment of the housing market at the time, the view was taken that it would be better advantaged by affordable housing and so, the development site was sold to Southside Housing Association with CCG providing a full turnkey construction solution to deliver 35 one and two-bedroom flats in a mix of social (20) and mid-market rent (15) tenures. The design that was taken forward was a single block reaching up to five storeys in an ‘L’ shape that maximises the southerly aspect whilst retaining a semi-privately enclosed courtyard to provide car parking, bin and cycle stores as well as an area of soft landscaping at the Admiral Street entrance. The overall specification of the Admiral St properties was chosen to reflect the tenure and associated target market of the end user. In this case, Southside HA understood what their tenants required from their property including space, light, appliances, and storage. Each property offers a spacious, comfortable living arrangement with all space standards capable of future adaption in accordance with DDA and Secured by Design. Flat types vary in size by offering a mix of enclosed kitchen spaces or having an open-plan living room/ kitchen arrangement whilst the ceiling height of 2.84m creates the impression of additional space and light, complemented by large timber fully-reversible windows manufactured by CCG Manufacturing. What makes Admiral Street so unique as a residential development is the innovative approach to offsite construction technology as it is the first residential development constructed by CCG that utilises a hybrid timber solution for the building’s superstructure where CCG’s ‘iQ’ panelised timber frame system was used in conjunction with Cross Laminated Timber (CLT). 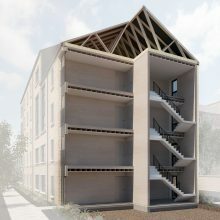 Having learned about the applied use of CLT at the award-winning Ellerslie Road development, CCG has innovatively looked at new ways of how (rather than exclusively building using CLT) structural timber can be used as an alternative to masonry/ traditional materials when utilised for the common areas of a flatted housing development in order to improve site-based efficiencies. Quality – thanks to minimal settlement between both timber solutions. The panelised timber frame system integrates more naturally with CLT causing less settlement, thus, improving the standard of finish. 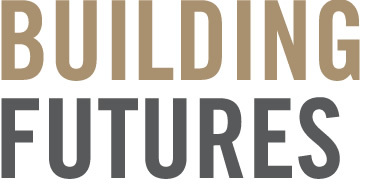 Speed of build – is significantly improved thanks to the ability to erect the superstructure in sequence. Without needing to stand down for masonry works, the roof is closed as one achieving wind and watertight status much faster: Admiral St saw a 5-week reduction in the timber frame erection programme. Site management – like CCG’s ‘iQ’ system, CLT is delivered to site and craned into position which reduces pressures on the site size – a key aspect at Admiral St when considering its 2140m2 size – and storage. Furthermore, with the a more efficient site management, health and safety for staff is also improved. Commercial – with a reduction in masonry, this requires less staff with a combined 4 staff members and a crane operator to handle the erection of the superstructure, further aiding site management and reducing inflationary pressures associated with downtime. This can prove a long-term advantage considering the wider economic factors associated with the national skills shortage. 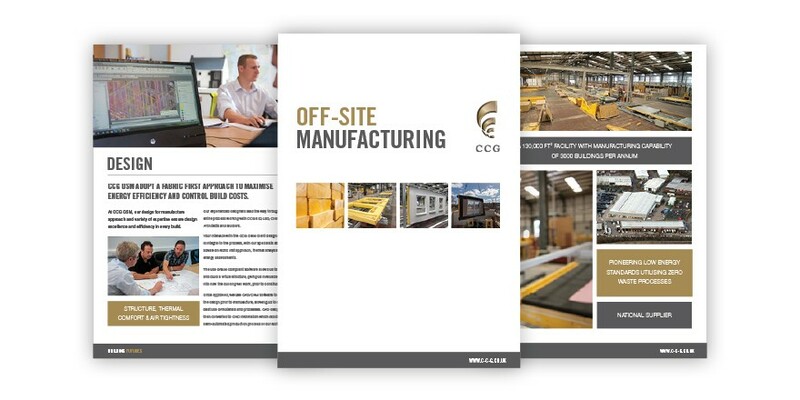 Environmental – CCG’s offsite methods of construction are met with another offsite manufactured solution, equally providing an innovative solution to maximising environmental performance and reducing the overall carbon footprint of the development. 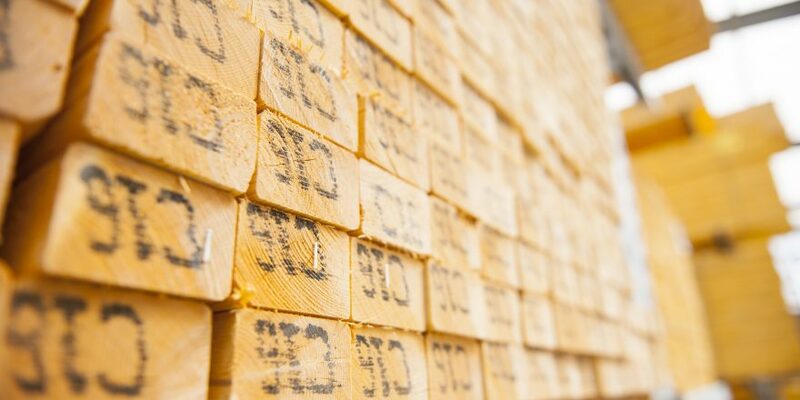 An example when compared with masonry is in the CLT itself given its ability to sequester carbon offering an estimated 50% saving in embodied CO2. Whilst the use of CLT at Admiral St was originally based upon a prototype approach to hybrid timber integration, CCG has embraced the technology in order to maximise our capabilities in the delivery of our projects and providing long-term advantages to our clients and, ultimately, the end-user. This same approach will be seen again at the Gallowgate, a contract that is currently being constructed on behalf of GHA and is set for completion in 2020.